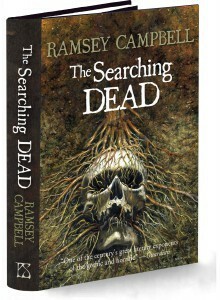 Horror legend Ramsey Campbell discusses his new trilogy. There are some things in life that are simply too good to miss. This is one of them—THE SEARCHING DEAD, Volume 1 of THE THREE BIRTHS OF DAOLOTH. I envy you for the journey you are about to take. Kind of! Gary: I was delighted to recently review The Searching Dead [LINK] and made no secret of the fact that I consider it one of your finest, most intimate works, not least because it appears to draw on aspects of your childhood. I hope we can explore these autobiographical strands below, but first could you tell me a little about the novel – the first part of a trilogy called The Three Births of Daoloth, of course – and its genesis? Ramsey: Since around the turn of the century I’ve been returning to my oldest themes in an attempt to do better by them. The Darkest Part of the Woods, for instance, revives Lovecraft’s unused idea on which I based “The Insects from Shaggai” back in 1962, because I believe I ruined it in that tale and wanted to recapture if I could the evocativeness of Lovecraft’s transcribed dream. More recently my good old friend Pete Crowther suggested that I might write a Mythos novella (Brichester Mythos, that is, which of course is a pale shadow of Lovecraft’s) set in a Northern coastal town, and The Last Revelation of Gla’aki – in which I tried to make more sense of some of the notions in “The Inhabitant of the Lake” and perhaps capture a little more of a sense of the cosmic – was the result. After that he gently persuaded me to attempt a horror trilogy. Now, I won’t write in a particular form unless there’s an actual reason to use that form, and so it took me years to see a reason for this one – the fact that the three volumes span several decades, with some of those separating each pair of books. It’s also yet another bid for cosmic terror, in the hope that I’ve learned enough by now to achieve at least a little. That’s my persistent ambition, and I can only hope to bring it off. Gary: I’m certainly keen to see how it develops. Let me ask about challenges involved in writing a trilogy of novels. You’ve often said that your best material comes when you don’t follow a plot, but I wonder whether such an ambitious undertaking required a different approach. For instance, if I were writing something similar, I’d worry that developments further down the line might conflict with earlier, already published material. How did you address this issue? Ramsey: I fear you’ve answered your own question, Gary. I worry, except when I’m panicking. I did consider not publishing any of the trilogy until I’d completed the final drafts of all three volumes, but we decided to go ahead with the first one, and so I’m committed to seeing them into print as they’re finished. I’m just hoping that my subconscious has had enough sense of the entire structure and its developments that I won’t find I’ve made any massive errors that need to be addressed somehow. At the time of writing I’ve done the first draft of the second volume, Born to the Dark, and am amassing material for the third, which I’ll start writing as soon as the second is rewritten. Right now I do have a reasonable sense of where I’m going, though that will pretty inevitably change in the course of actually writing. Gary: Sounds daunting. Good luck! Stephen King says something interesting about The Shining, how, while writing it, he hadn’t realised how much it related to his own life. To what extent were you conscious of drawing upon what appear to be autobiographical memories while writing The Searching Dead? Ramsey: It’s actually not as specifically autobiographical as you might think. I’ve sometimes had the experience Steve cites – I give you my word that I didn’t realise how many of my childhood experiences “The Chimney” drew on until years after the story was published – but in The Searching Dead I’ve tried to place such elements at a conscious distance or write variations on them, though certainly not to rob them of truth. So the staff of the Holy Ghost school are almost entirely invented (although they paraded out of my mind in the course of a single morning here at my desk), except for the Latin master, who is a bit like one I had. Dominic’s loss of faith is a lot closer to the one I experienced in my adolescence, and his reasons are quite like mine, but I haven’t given him specific incidents from my past. The dentist is all too real, though. I still remember him from my early teens, and that paragraph is very accurate (though I left out his habit of playing Gilbert and Sullivan over the speakers in the waiting-room). Gary: And how about the experiences of becoming a writer that Dominic goes through? To me, these felt hugely familiar – that sense of self-consciousness, being eager to please, and assimilating what one has learnt from favourite new writers. Was this how it went for you? Ramsey: Pretty much, though my trajectory at school was different. 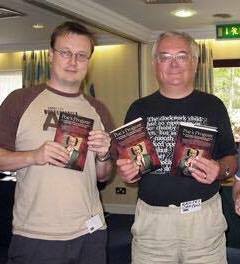 In my first year at the Christian Brothers grammar school the English master encouraged me to read my tales to the class and then to submit to the school magazine, though my submission wasn’t as ill-received as Dominic’s – the editor, who wasn’t a fan of the ghostly, simply changed a word at the end of my tale to do away with the supernatural. But certainly trying to learn from (or at least imitate) favourites was my way back then – Arthur Machen to begin with and then John Dickson Carr before Lovecraft gave me my crucial focus. Gary: It’s interesting that you mention Machen, because I detected in your novel strands of “The Great God Pan”, which was an influence on another you admire, King’s Revival. It’s clear from your ‘mission statement’ that you’re situating the trilogy in Lovecraft’s arena, but I wondered if, while documenting Christian Noble’s dark activities, the great Welshman figured in your thinking, too? Ramsey: Not so consciously here as he certainly did in The Kind Folk (not to mention “The Place of Revelation”). But I do see that the more mystical elements I’m trying to rediscover in the trilogy lead us back through Lovecraft (where that kind of vision is more prevalent than is often acknowledged, for instance in the quote from the Necronomicon in “The Dunwich Horror” and much of The Case of Charles Dexter Ward) to Machen. Come to think, “The Dunwich Horror” itself explicitly acknowledges Machen. In my trilogy I think this element is an aspect of my latest bid to reach for cosmic terror. Gary: The attempt to achieve cosmic terror is one to which you’ve returned repeatedly during your career. Why, among your other achievements – including psychogeography, exploring abnormal states of mind, and the comedy of paranoia – does this ambition remain important to you, and how do you hope the trilogy will fulfil it? Ramsey: Because I think it’s the highest aspiration of the field – a sense of awe that can border on the numinous, or more precisely a dark version of that experience. I find it in the best of Lovecraft and in tales such as “The Willows”, for instance. Perhaps it’s precisely its indefinability that both lends it power and makes me want to achieve it, but as to how I hope to do so – well, I can only trust my instincts and urge them not to let me down. Gary: Okay, let’s return specifically to The Searching Dead. On the first page your narrator writes, “I might have noticed more if I hadn’t been preoccupied with the changes taking place in my own small world.” Unlike for Lovecraft, aspects of character and its socio-historical setting matter to you. How did you go about rendering the mores of 1950s Liverpool so rich? Ramsey: Ah, many of those are autographical in at least a general sense. Certainly I tried to draw on my memories as much as possible for telling details (the kind I find so evocative in Graham Greene). 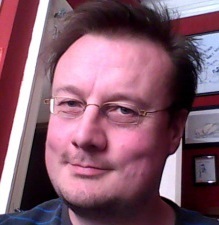 Tony Snell (one of the Radio Merseyside presenters) happened to refer on the air to his own memories of starting a new school, and those opened a whole cache of mine. I’m a great believer in happy accidents when I’m writing, and catching his broadcast was certainly one. Gary: I was also struck by the importance of fiction to your characters, the way it shaped identities as they mimicked film stars’ mannerisms and interpreted their activities through stories. Among so many other influences examined in The Searching Dead – especially religion, politics, and science – how important do you feel fiction is in terms of constructing such realities? Ramsey: Well, you know me – I’m not going to start ranting about the dangers of imitating fiction or more precisely accusing fiction of being dangerous. But I do recognise that we derive parts of our identities from what we read and watch, so that (for instance) most British folk are to some extent American, perhaps especially when we’re young. Elements of us are composed of bits of films and books and (probably popular) songs, not even necessarily our favourites. I think I’ve also addressed the gap between fictional depictions and reality quite often in my tales, which brings us all the way back to the recurring theme of how what’s perceived differs from what’s real. Gary: It’s also interesting to reflect on the influences of different fictional forms on your work. For instance, one of my favourite moments in The Searching Dead – not to spoil it for readers, but I’m thinking of the frightening cinema bathroom scene – would be very difficult to film effectively. Despite your love of film, do you aspire to achieve the kind of effects that only prose can do well? Ramsey: Absolutely, Gary. One of the aspects of horror fiction at its best that greatly appeals to me is how it conveys the uncanny, the terrifying, the disturbing or whichever quality it’s communicating through the selection of language. In Lovecraft this involves paragraphs that are very formally constructed, for instance, while in M. R. James the moment of terror is often embedded within the paragraph and all the more powerful for lying in wait in the prose. I think many of the most memorable moments in prose horror fiction depend on the use of the perfect word or phrase, which can’t be transferred to the visual or other media. Sometimes, of course (as in the unforgettable line about holding hands in Hill House), it can. Gary: There are certainly scenes in The Searching Dead – the voice in the house (“Leave me dead.”), the visit to France, the scene under the church – which exemplify this quality. I’d envy those yet to read it if I didn’t realise there were two volumes to come. I know you don’t like talking about unfinished projects, but can you give any hint about the content of at least the next one, Born to the Dark? Gary: Sounds terrific. I can’t remember when I looked forward to a new book more. Here’s to autumn 2017! Thanks for your time, Ramsey, and all the best with the trilogy. The Three Births of Daoloth looks set to become a considerable work of weird fiction.